Q-Ball is perhaps one of the lesser known variants of draw poker but for those who play it can be an interesting deviation from the poker norm. ‘Draw’ poker refers to a style of poker in which players are given the opportunity to discard and replace some, all or none of their cards at some point during proceedings. 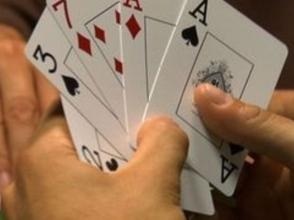 The aim of Q-Ball is to create the strongest five card hand according to standard high poker rankings. It’s generally a home game and that’s reflected by the use of blinds which are normally placed by the dealer and player to the left (both small blinds) and player two places to the left (big blind). A fourth card is now dealt after which follows another round of betting; then a fifth card is dealt to each player and one more betting round. Now the draw takes place and here players can discard and replace none, one or all of their cards as they wish. Of course the more cards you draw the more obvious it is you don’t have much of a hand. Now there’s one more betting round, assuming that more than one player remains in the game, followed by the showdown. The remaining hands are compared according to standard poker rankings which you you access by clicking the link at the top of this page.